A fellow blogger asked me to hook her up with a recipe for chicken breasts. You know not what you ask dear. I have SO many recipes for chicken, it's disgusting. I will post a few here to whet your appetite. I must say though, my very favorite recipe for chicken breasts is this: Heat a large frying pan over medium-high heat and add some olive oil to it, I would say 1-2 Tablespoons for 2 breasts, mince a clove or two of garlic, about 1 clove for 2 breasts, and add the oil to the garlic as soon as the oil starts to "shimmer" in the pan. Stir it around quickly so it doesn't burn and add the chicken breasts to it. Sear them on both sides and turn the heat down a tad--to medium I'd say--and cook about 5 minutes per side until they are done. This sounds so ridiculously easy but let me tell you, when the garlic hits the olive oil, the smell is nearly Heaven. I was making this once when a friend was over and she asked what I was cooking and when I told her, she had to come and see for herself ~ it smells that good. OK, I must get on with the recipes. P.S. Any purists, bow out now, some of these recipes call for canned "cream of" soup! are done. Toss in olives and heat through. baking time. Serve over rice. Add mushrooms and saute lightly. (1-2 min) and add whole butter to finish. olives. Cook and stir for 2 minutes-add lemon juice. chips~came up with this for the family since they love those chips. baking tray and bake for about 15 - 20 minutes or until the chicken is done. concentrate and lemon juice. Blend in cornstarch and curry powder. platter and garnish with orange slices and toasted almond slices. Spoon sauce over. Serves 4. 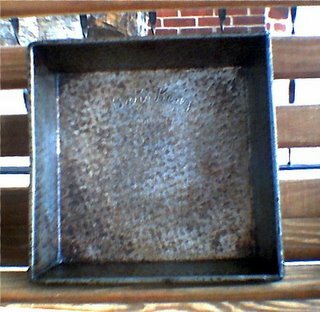 This is a Bake King pan - no info on that one since I forgot to ask Dad (he's in antiques). 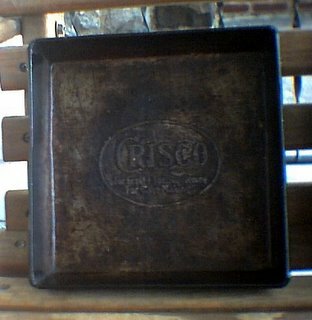 This pan is a Crisco pan that Dad says is most likely from Depression Era through the 50's when giveaways with purchases were a big thing. They are great pans, but way before I acquired them I was still making Grandma's brownies (the right way) in glass pans and other aluminum pans. They're very neat to have. Leftovers? Who doesn't have them from Thanksgiving? Our favorite for leftovers from T-Day is this soup but think leftovers before you up and look for the exact ingredients. I've made this with leftover gravy thinned out instead of stock; leftover corn; leftover potatoes both mashed and whole - whatever I had on hand. It's hard to mess this one up - it's great no matter what! Saute bacon, celery, onion & garlic until translucent. Add stock and potatoes-bring to a boil and reduce to simmer until potatoes are tender. Add corn, turkey, and seasonings. Simmer 20 min. Add roux in a thin stream-whisking constantly. Cook until thickened, remove bay leaf and serve. Just before Grandma fell ill I made a batch of her famous brownies and was going to blog them. I also wanted to add to that the recipe for her favorite cookies. Life happens though, and I found myself unable to even approach the subject of Grandma without great pain. Life goes on also and I want to share these two recipes. A perfect batch of grandma's brownies. The brownies my Grandma made are like no other I have ever had. These are truly "gooey" and absolutely sinful. Grandma knew this and even though she shared her recipe she failed to mention, on purpose, the one thing that made them so wonderful. They don't get more moist than this! I was surprised to hear my mother tell me this since Grandma was so sweet and lovable, and a true Christian woman. But, like the rest of us, Grandma had flaws and one was that she knew how much everyone loved these brownies and she knew that if they all knew how to make them, they wouldn't need her to do it. Grandma loved being needed. I guess that isn't really a flaw after all. In two 8x8 baking pans (metal is preferable) melt 1 stick of margarine each. You can use butter but the texture will change. In a medium bowl mix together 2 cups sugar and 2 T cocoa (grandma means SERVING spoon so, about 1/2 cup or slightly more). Add melted butter and 4 eggs. Blend well and add lastly 1 cup flour and 2 cups mini marshmallows. Blend and divide equally among the already-buttered pans. Bake at 350 degrees F for 25 minutes or until puffy and slightly browned on top. The next is a recipe for Confetti Cookies that originally came from Juanita Searfoss, Grandma's niece. When Grandma was not feeling well, these cookies were the only thing she could tolerate. I made them innumerable times over the last 12 years for her and she never tired of them. They have never tasted exactly the same to me as they did when I was a child but then, many things are that way. These are similar to Mexican Wedding cookies. Mix shortening and sugar and salt. Add red food coloring to milk so it distributes well-ebough so the dough will be a pretty pink. Add extract to milk also. Add flour alternately with milk. Add confetti and mix well so it gets throughout the dough. Roll into 1" balls and flatten slightly on greased cookie sheets. Bake at 350 degrees F for 15 minutes. Do not let them brown! The original recipe says to roll them in powdered sugar while warm but I always wind up with a sticky mess if I do this so I let them cool first. Yesterday went off with nary a hitch...almost. If the things that occured in my kitchen occured in a clients kitchen, I surely would be out of business. I stared, mouth-agape, for a moment frantically searching my blonde brain for what to do. I needed something under there but definitely NOT the cornbread. I grabbed the cornbread pan to pull it out and immediately scraped the top of the bread across the top rack (ugh) and proceeded to find a flat but semi-deep pan. Almost every pan in the house was in use at that moment, dinner being a mere 30 minutes away. Luckily I had just finished emptying and washing a rectangular cake pan and got it under the big guy before too much of those all-too-precious juices were lost on the bottom of the oven. Whew. After that everything went like clockwork but the sheer terror of the moment (it's a mortal sin in this household NOT to have gravy) stuck with me until I sat safely in my seat after having made sure everyone was served. I so hope your day was wonderful; after the turkey incident we had a terrific time having a scavenger hunt and picking names for our annual Secret Santa. I don't know HOW I forgot this but, I never make a turkey without first brining it. Here is a basic brine recipe you can try, but I really prefer just plain old salt. About 1 cup for a 20 lb turkey and overnight soaking should do it. This recipe will give you the full out method for doing it yourself. Combine salt, herbs and water in a pan and bring to a boil, then simmer for 10 minutes. Allow the mixture to cool then over turkey in pot just large enough to hold both. If turkey is completely covered, don't worry about using all of brine. Cover with foil and refrigerate 6 hours or overnight, turning 2 or 3 times to make sure turkey is totally submerged. Place turkey on its side on rack in shallow roasting pan. Roast at 450 degrees 15 minutes. Turn turkey to other side and roast another 15 minutes. Turn breast-side up and roast another 15 minutes. Reduce heat to 325 degrees and roast until meat thermometer inserted in center of thickest part of thigh registers 160 to 165 degrees, about 2 hours. Remove from oven and set aside 20 minutes before carving. Recently a very dear and beautiful woman named Bonnie removed her blog, Belle On Her Toes, from the web. Although I understand the need for a break from it all, I will still miss her lovely posts very much. We both shared a love for tea and this is for her. And keep that place of the soul serene." water. Add the tea and 6 oz boiling water* for each cup of tea. Cover and let steep for 5 minutes. Strain into cup to serve. of each cup of tea. ~~~~~~~~~~ *"A friend of mine who grew up alongside a samovar has only one way to describe proper water for tea: A mad boil." In the same forceful way she never says rolls or toast must be hot, or very hot. They must be "hot-hot-hot!" This is pronounced as much as possible like a one-syllable sound of intense excitement, about no matter how dull a bun. It is safe to say that when the water boils, as it surely will, given enough heat under it, it is ready. 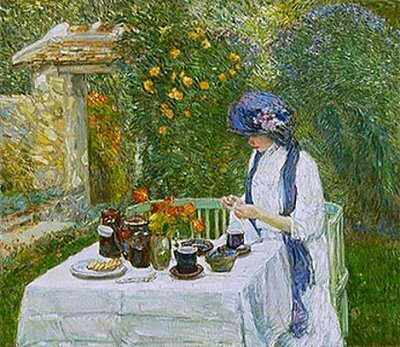 Then, at that moment and no other, pour it into the teapot...If it cannot be used then, turn off the heat and start over again when you yourself are ready; it will harm you less to wait that it will the water to boil too long." In a small bowl combine the butter and mint. Mix well. 4 sandwiches. Slice them in half diagonally. In a large bowl, cut the butter and lard into the flour with a pastry blender or 2 knives until the mixture resembles small peas. Sprinkle ice water over the mixture a tablespoon at a time and stir with a fork (or hands) until the pastry gathers into a ball. Sprinkle with a little flour, cover and refrigerate for 1 hour. Divide the dough into 2 portions and roll each into a circle about 1/8" thick. Cut out in rounds to fit 2 1/2" to 3" tartlet pans. Press each into a pan and prick with a fork-bake blind (covered with foil and weights such as dry beans) in a 375 degree F oven for 12 to 15 minutes. Remove foil and beans and put back into oven for 8-10 minutes until pastry is lightly browned and firm. In a medium bowl, beat the eggs. Add the cottage cheese, onion and garlic and mix well. In a sieve, press the water out of the spinach. Add the spinach, cheeses and salt to the egg mixture. Stir until well blended. Fill each pastry shell with about 2 Tablespoons of filling. Put the shells on baking sheets and bake for 20-22 minutes, or until they are puffed and golden on top. Serve hot. Preheat the oven to 450 degrees F. Line 20 or more miniature muffin cups measuring 1 3/4 inches across with paper baking cups. In a medium bowl stir together the flour, sugar, baking powder, and salt. Set the mixture aside. In another medium bowl lightly whisk the egg yolk. Whisk in the milk, then the butter. Quickly stir in the dry ingredients, stirring only until they are moistened. The batter will be a little lumpy. Fold in the berries. Spoon the batter into the prepared muffin cups, filling them so that the batter is almost level with the rim. Bake for 9 to 11 minutes, or until a toothpick inserted in the center of a muffin comes out clean. Cool in the pan for 1 minute. Remove the muffins from the pan and serve hot. Repeat the baking procedure with any remaining batter. If there is not enough batter to fill all the muffm cups, put water in the empty ones during baking. In a heavy 4-quart saucepan, combine the berries and lemon juice. Bring to a boil over medium-high heat, stirring often. Stir in the sugar, lemon zest, and cinnamon, and let the mixture boil to dissolve the sugar. Remove the pot from the heat. Stir the jam with a long-handled spoon and skim off any foam that rises to the top. Ladle the jam into hot, sterilized half-pint canning jars, leaving a 1/4 inch space on top. Place a piece of cinnamon stick in the jam in each jar. Seal with canning lids according to manufacturer's directions. Cool the jars upright on a wire rack. Store in the refrigerator up to 1 month. For longer storage, process the jars in a boiling water bath for 5 minutes after sealing. (Add an additional minute of processing time for each 1,000 feet above sea level.) Coolon a rack and label. Store the jars in a cool, dry, and dark place. Preheat oven to 350 degrees F. Spray twelve 1-cup fluted mini-tube pan cups with nonstick coating spray. In a medium bowl combine the flour and baking powder. Stir a few times to mix well. Set aside. In the large bowl of an electric mixer, cream the butter and sugar at medium speed for about 5 minutes, or until they are light and fluffy, scraping the sides of the bowl often. Add the orange zest and the eggs, one at a time, beating well after each addition. Add the dry ingredients to the egg mixture, alternating it with the milk. With the mixer at low speed, blend the ingredients after each addition. When all the flour and milk are incorporated into the batter, add the vanilla and mix well. Fold in the nuts. Spread the batter evenly in the prepared cups, using about 2/3 cup of batter for each. Bake for 20 to 25 minutes, or until a toothpick inserted in the center of a cake comes out clean. 5. Set the pans on wire racks and let the cakes cool for 15 minutes. Run a knife carefully around the edges of the cakes to loosen them. Remove the cakes from the pans and cool completely on the racks. In a small bowl combine the confectioners' sugar, vanilla, and enough orange juice to achieve a thin consistency. Drizzle the glaze over the cooled cakes. I'm having a frustrating (yes, we'll stick with that word rather than what I would really like to say) day. I never realized before that I don't eat when I'm upset, I cook. Some write, some clean, some exercise~different catharses for different people, mine is cooking. I woke up in a mood after having gone to sleep in a mood and as soon as I got home from the daily school drop-off I started culinary creations. I'm in the midst of egg rolls and crab rangoon and I just whipped up a fairly tame tapenade. I really could almost care less whether I eat any or not, I just felt the need to do something besides sit and stew myself. In a large skillet, cook pork over medium heat until no longer pink; drain. has evaporated. Remove from the heat. brown. Drain on paper towels. powder. Place 1/2 tsp. of the mixture. In the center of a won ton wrapper. packets until delicately browned, about one minute per side. Thanksgiving is speeding toward us and this year we are staying home rather than going to my mother-in-laws as usual. I am delighted, of course, since I get to cook for days on end. Well, I have my work cut out for me trying to figure out a menu that will suit everyone's tastes. I'm sure I can handle it. In the meantime, here are recipes for most of the above. Share your menu as well! 1. Cook onion and celery in butter until translucent. 2. Add flour and whisk in to make a roux - do not brown. 3. Add stock and remaining ingredients. 4. Simmer until onions and celery are tender - approximately 30 minutes. smooth and put through a strainer. 6. Return to pot and simmer until heated through. 7. Remove from heat and immediately add half and half. Stir well. 8. Serve topped with croutons. 1. Toss bread cubes with butter and sprinkle with nutmeg and ginger. 2. Bake on a cookie sheet at 450 degrees F - tossing frequently until browned and crisp. Store in an airtight container and use within one week. potatoes are cooking, put broken bread in a skillet with 1/2 stick butter. for 30 minutes or until lightly brown. Saute until onions are tender-pour this over dry bread cubes - about 1 loaf of bread - that has been dried in the oven by placing slices on a cookie roll pan and setting in the oven on very low or over night to dry and then torn into bite size pieces or you can dice to the size you want. Add canned chicken broth or liquid off giblets if you boiled them for the dressing, just until moist and begins to stay together when mixing (I use my hands). This will stuff a medium size turkey and any left over from stuffing the turkey can be placed into a greased casserole and baked the last 45 minutes of the turkey. MIX soup, milk, soy, pepper, beans and 2/3 cup onions in 1 1/2-qt. casserole. STIR and then sprinkle with remaining onions. Bake 5 min. Grease deep casserole. Put the two cans of corn and melted butter in casserole; mix well. Add Jiffy cornbread and blend. Fold in the sour cream until well mixed. Bake, uncovered at 350 for 50 minutes or until golden brown. pumpkin and mix well. Stir in eggs until well blended. MIX sugar, salt, cinnamon, ginger and cloves in small bowl. Beat eggs in large bowl. Stir in pumpkin and sugar-spice mixture. Gradually stir in evaporated milk. This recipe was published by Dear Abby many times over the years in her advice column. Preheat oven to 350F. In a large bowl, combine corn syrup, sugar, eggs, butter, salt and vanilla; mix well. Pour into pie crust and sprinkle pecan halves over top. Bake 45-50 minutes or until toothpick inserted in center will comes out clean. If pie or crust appears to be getting too brown on top, cover with foil for remainder of cooking time. Allow to cool. This soup is so simple and so good. It's getting around to what I call "soup weather" here, but today is a little warmer than usual and this is not too heavy. 1. Mix together all ingredients for meatballs until very well combined. 2. Bring 10 cups of chicken stock to a slow boil. 3. Drop meatball mixture by the teaspoonful into the boiling stock - one at a time. 4. When all meatballs have been added to the stock, add remaining ingredients and simmer until carrots are tender and pasta is cooked - about 20 minutes. 5. Serve with extra Parmesan cheese sprinkled in each bowl.